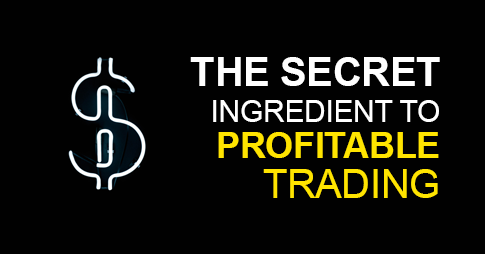 What is the best Forex trading strategy? This is, of course, a question I get asked many times a day and it is a very important one. When you start trading, you need to commit to one particular trading strategy and then focus all your attention and energy on making it work. Most traders never do that and then fall victim to system-hopping. 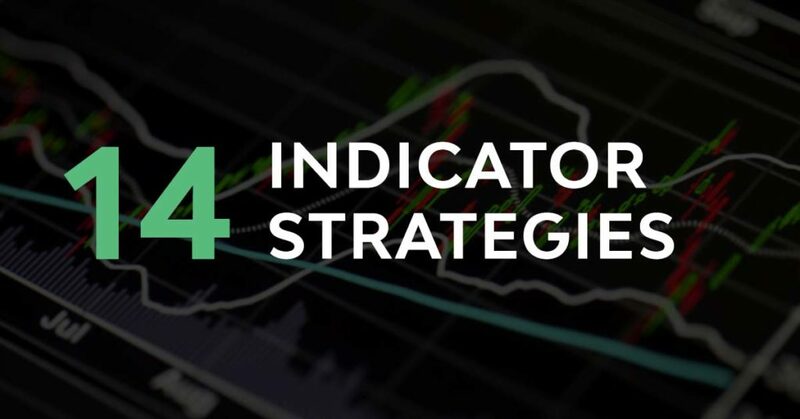 In this guide, I will explain the differences between the various strategy types, what their premise is, when they work best and what you have to know when choosing a particular forex trading strategy. As you will see, each trading strategy and style try to capture a different market behavior. This is also going to be one of the main takeaway points because I am a huge believer in specialization. Instead of trying to trade all the time, you should pick a specific market behavior and then try to become the best at it. Trend-following is the approach that most traders experience first and sayings like “the trend is your friend” has been around for decades. 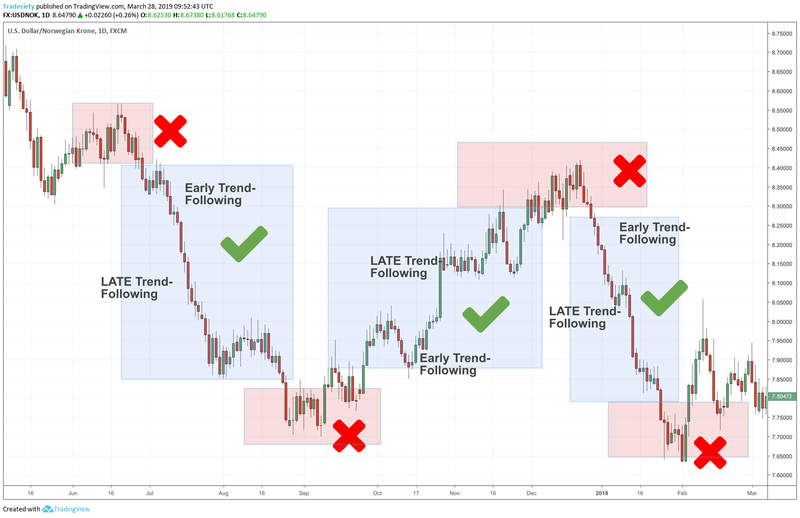 Trend-following, as the name suggests, is a trading style where the trader has to wait for an established trend before he/she can jump into the market. Thus, trend-following traders will have to wait patiently until a real trend is obvious. The screenshot below shows the portion of a market move that is typically captured by trend-following traders. The red areas highlight the market turning points and the blue areas are the trend-following phases. Many amateurs make the mistake that they want to predict a new trend before it exists and enter way too early. Those traders, although they believe that they are trend traders, are actually reversal traders. Then, there is also a difference between early and late trend following. 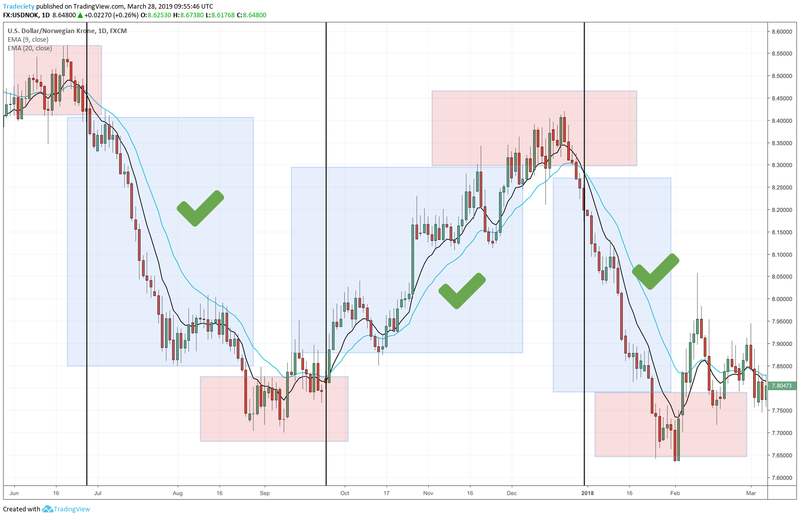 Since the trend following traders need to wait until a trend has been confirmed, the question that comes up is: when is a trend confirmed? 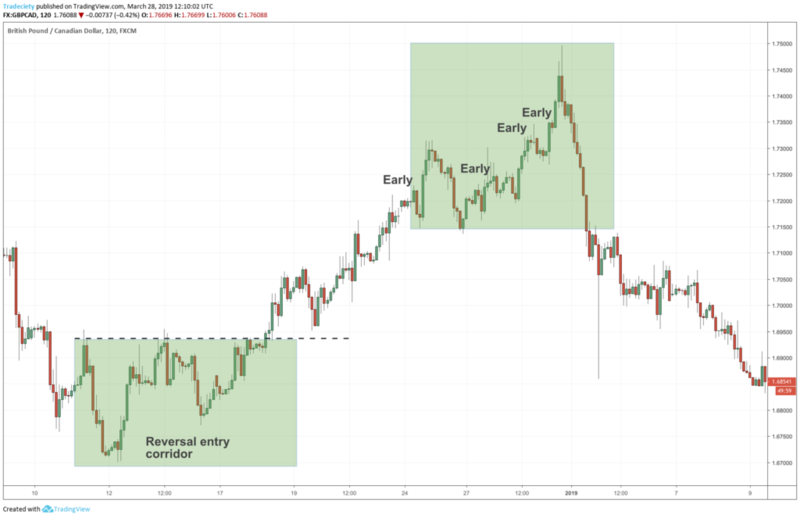 Early trend following traders try to get into a new trend as early as possible which can result in being too early and running into a false signal. The advantage is that the potential reward/risk ratio is much higher. Late trend traders wait for more confirmation. It can, of course, happen that they are too late, but their signals are often stronger. The trade-off is that the reward/risk ratio is not as high whereas the winrate is higher. 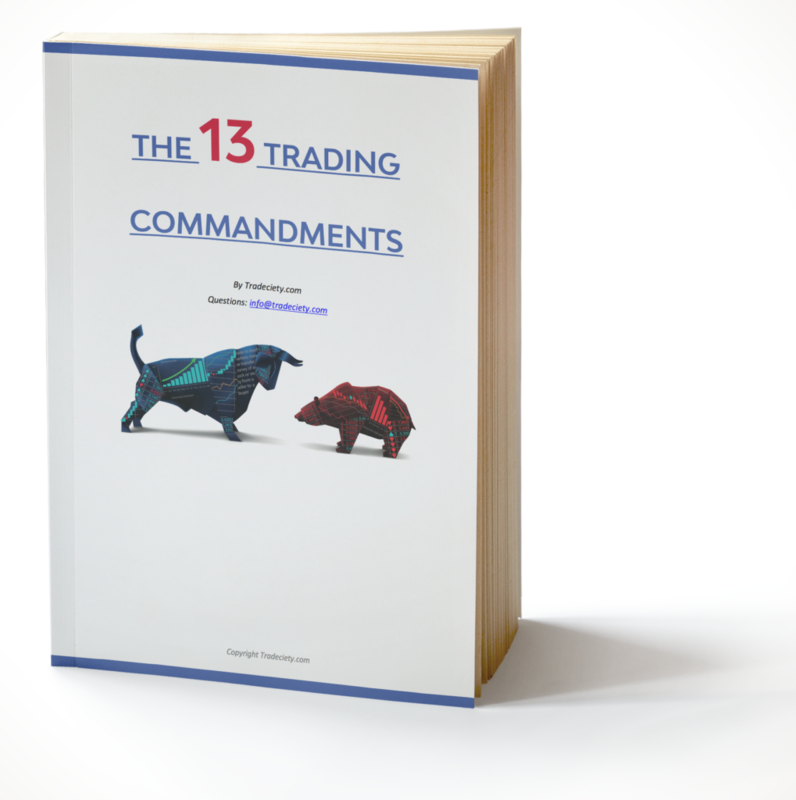 When it comes to trading tools, a trend following trader can choose from a wide variety. Momentum indicators like the MACD, RSI or STOCHASTIC are often popular. 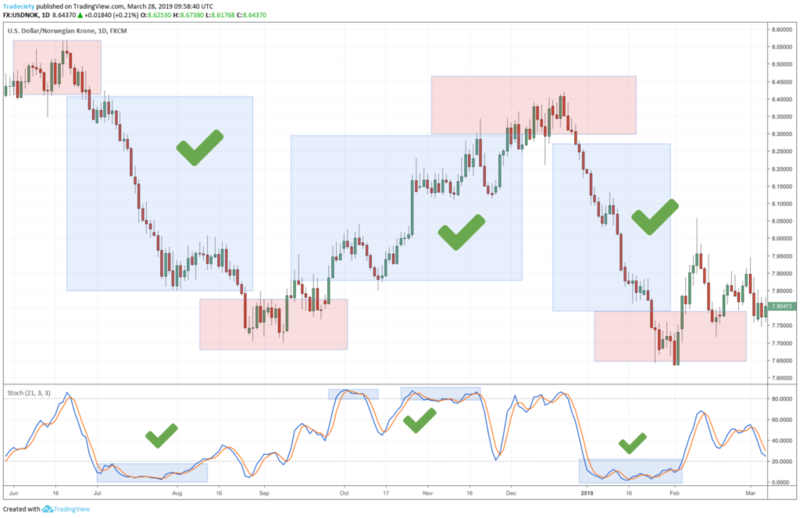 In the screenshot below, the STOCHASTIC is plotted and one way to get into trend following trades is to wait until the STOCHASTIC has reached the lower or upper area. Many traders make the mistake and believe that this can signal a reversal which is absolutely wrong. A very high or very low STOCHASTIC indicates a strong trend. Of course, moving averages are another popular trend following tool. Two moving averages work perfectly as a cross-over signal in the screenshot below. Each time the moving averages cross, a new trend is initiated. The great thing about such a cross-over system is that traders automatically stay away from picking tops and bottoms because the moving averages need some time to cross. 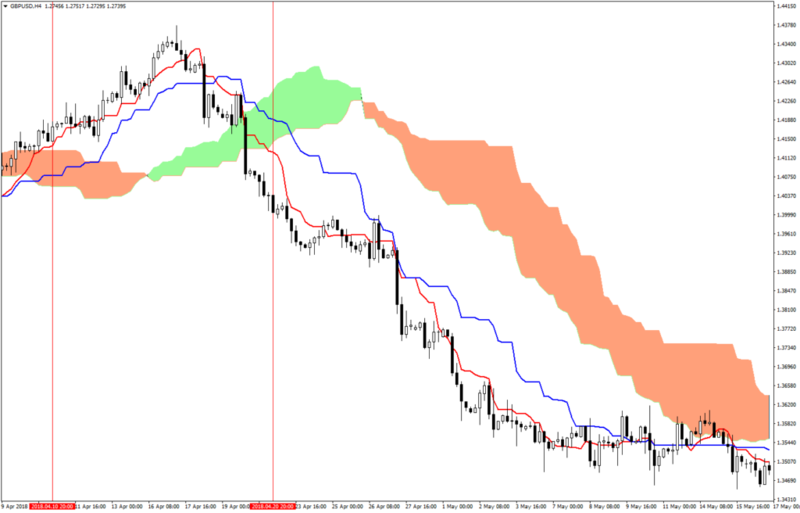 The Ichimoku indicator is another trend following tool. It is similar to a moving average cross-over system but the premises are different. The classic Ichimoku entry is given when the price breaks out of the “cloud” while the two Ichimoku lines are moving into the same direction. Pullbacks are a different type of trend following trading. Pullback traders look for an established trend and trade the so-called correction phases. Corrections are price movements into the direction opposite to the underlying trend. In the screenshot below, the market was in an uptrend and pullbacks (corrections) are the short periods where the price moved sideways or against the trend direction. The price usually moves in those up and down waves and a pullback trader uses this characteristic to time his/her trades. A pullback trader either waits for the price to continue into the direction of a trend or even gets into trades when the market moves lower. The danger of the second approach is that the pullback will not turn around. But the upside is that the reward/risk ratio might be greater. Not always does a market provide a pullback. The example on the left shows a market where the price just went down but never made a pullback. The second and third phase had multiple pullbacks and offered good entry opportunities for pullback traders. 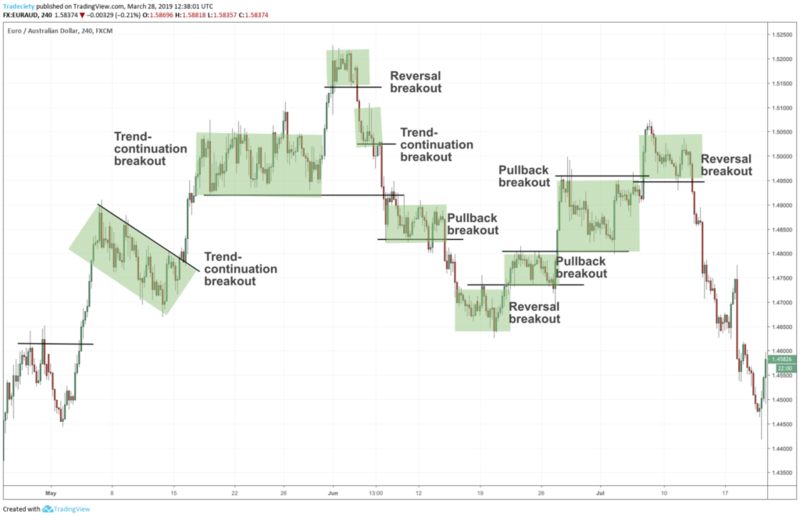 As you can see already, pullback and trend following trading have a lot of overlap and trend following trader often also trade pullbacks as a natural progression. There are, of course, many different ways how pullbacks can form on your charts. In the screenshot below, there are 3 examples. The price came back into the level 2 times before it continued the trend. The price overshot the previous high point and made a deeper correction. 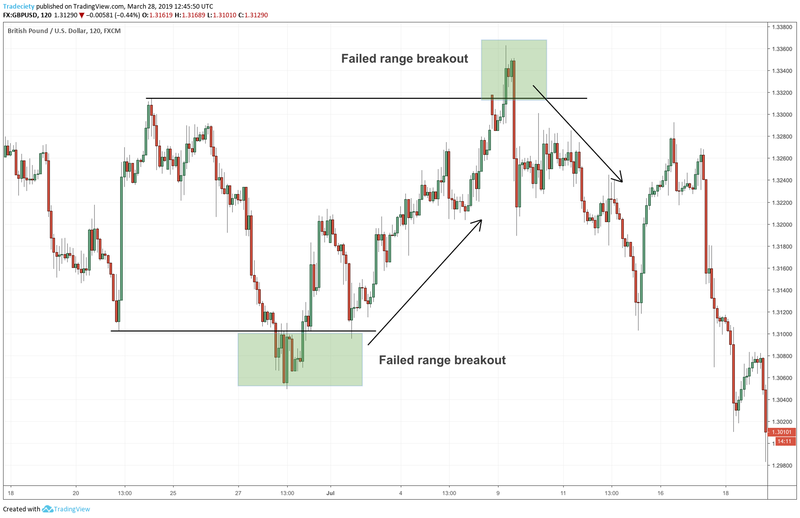 The price stalled at the breakout level and moved sideways for a while before continuing the trend direction. Moving averages are a popular tool for pullbacks as well. When the price is in a trending market and then comes back into the moving average, a pullback can be traded. Either, the trader trades the price when it hits the moving average or he/she waits until the price is resuming the trend direction. 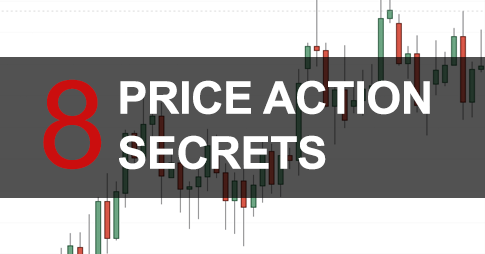 As we will see when we talk about breakout trading, we can also trade so-called price formations as pullbacks. In the screenshot below, the price was in a clear downtrend when a head and shoulders formation formed. 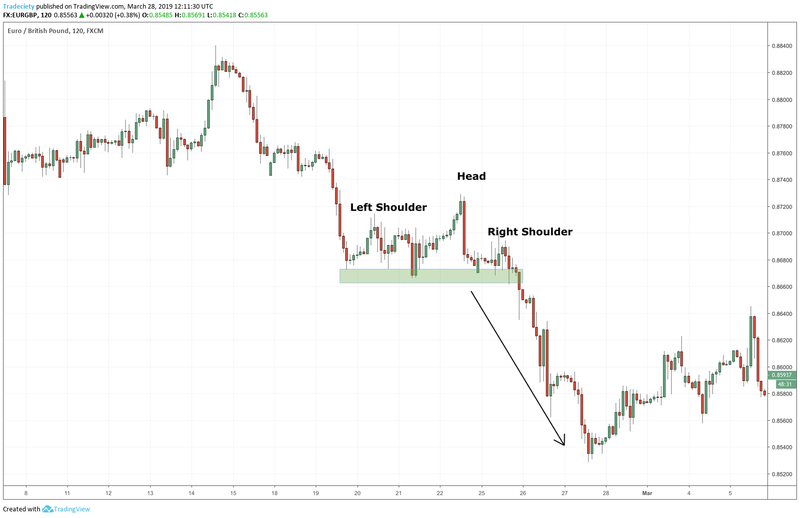 In such a context, the head and shoulders formation becomes a trend-following pattern and can be regarded as a pullback. The lines between pullbacks and trend-following are blurry here. Reversals are turning points and a reversal marks the true origin of a new trend. Therefore, reversal trading can be considered very early trend following trading too. However, it is usually more effective to choose between classic trend following and reversals because each trading approach has its own unique characteristics. The screenshot below shows a chart with different market phases and trend stages. Trend following traders will usually go for the early or mature trend. A reversal trader starts paying attention to a market once a market is entering the mature trend stage. This usually happens once at least 2 or 3 trend waves have formed. The dangers of being a reversal trader are being too early and constantly acting in a contrarian mindset. Many failed reversal traders are trying to predict a market turn way before it happens. 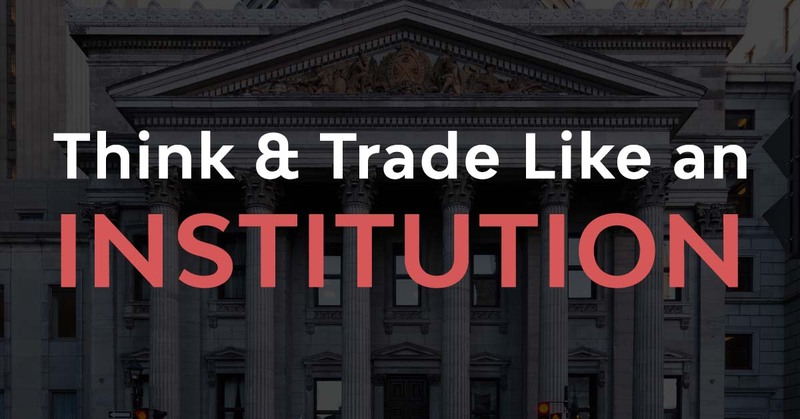 The greed is driving the traders here because they believe that the earlier they are, the closer they can enter to the absolute top/bottom and, therefore, get a much bigger reward/risk ratio. When it comes to reversal tools, divergences are the classic confirmation. 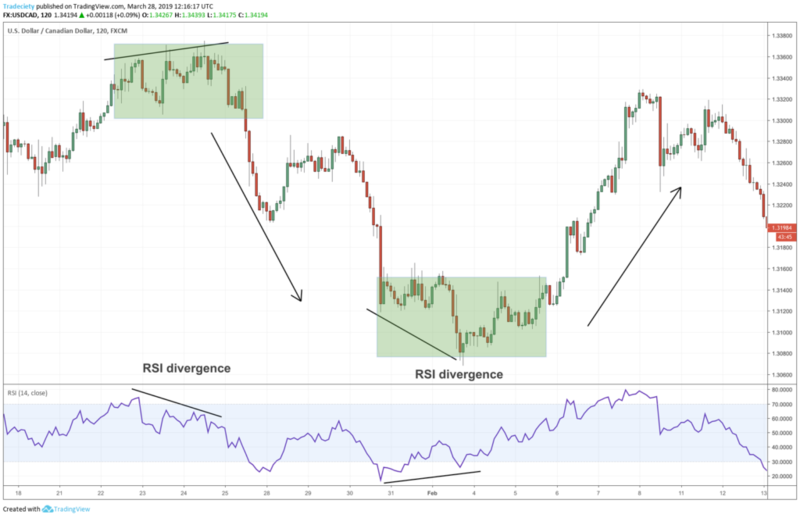 The RSI divergence shows exhausted trends where the trend power is fading. When a mature trend gives you an RSI divergence, a reversal can often happen. The RSI is usually a trend indicator, but when the RSI shows that a trend is losing strength, it can work very well as a reversal tool too. The MACD or the STOCHASTIC can be used as reversal tools as well. I view myself as a classic reversal or very early trend-following trader too. 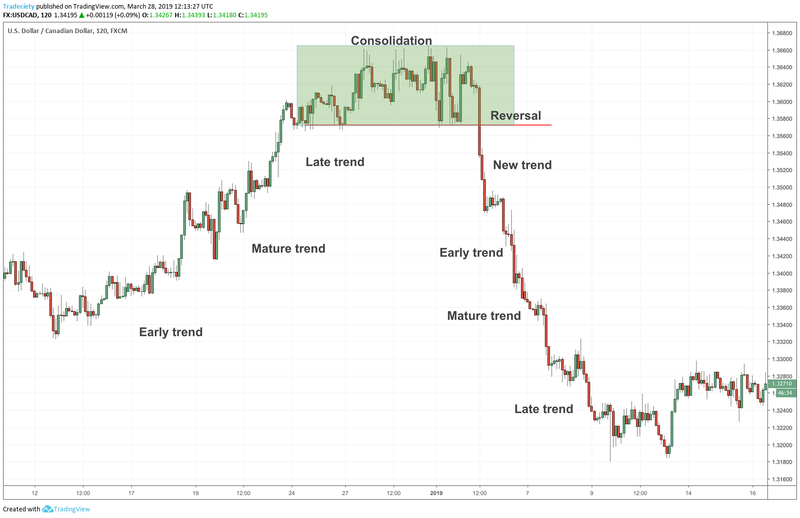 I was never comfortable chasing the trends as a trend-follower and once I understood that reversals don’t mean predicting turns before they happen, reversal trading became a “fun” way to trade. Breakouts can happen during trend following and also during reversal trading. 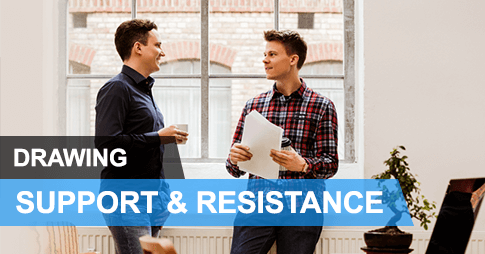 Breakout periods are often the link between two trending phases. A breakout describes the move away from a consolidation pattern. Consolidation patterns, as the screenshot below shows, can happen at market turning points (tops and bottoms for reversals) or during established trends. The screenshot below illustrates how consolidations and breakouts are the links between two market phases. A consolidation can happen at market turning points and breakouts are then trend reversal signals. 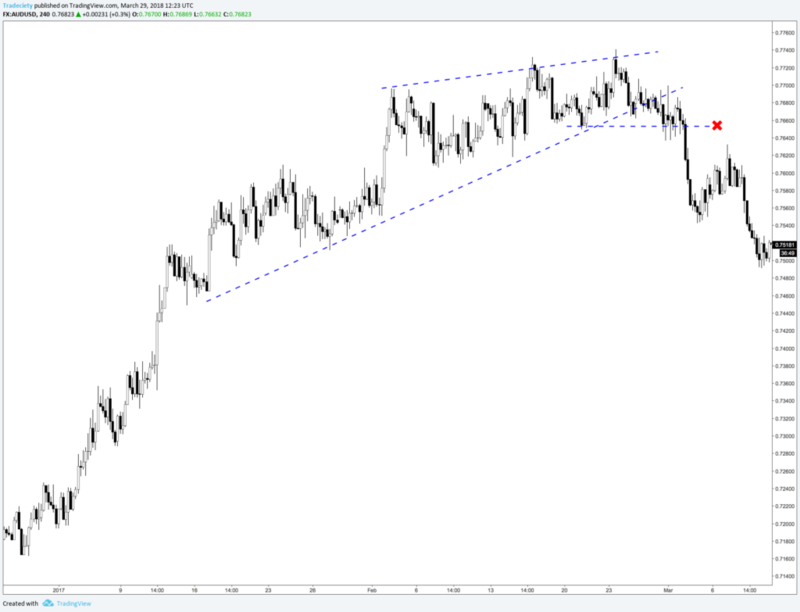 If a consolidation happens during an established trend, a breakout comes a trend following signal. This screenshot below highlights this characteristic once again and it becomes obvious how breakouts connect the different market phases. As a trader, it is usually best to choose one specific type of breakout. Trying to trade all breakouts can lead to bad results and confusion because each market phase behaves differently and, thus, requires a different set of tools, signals and understanding. 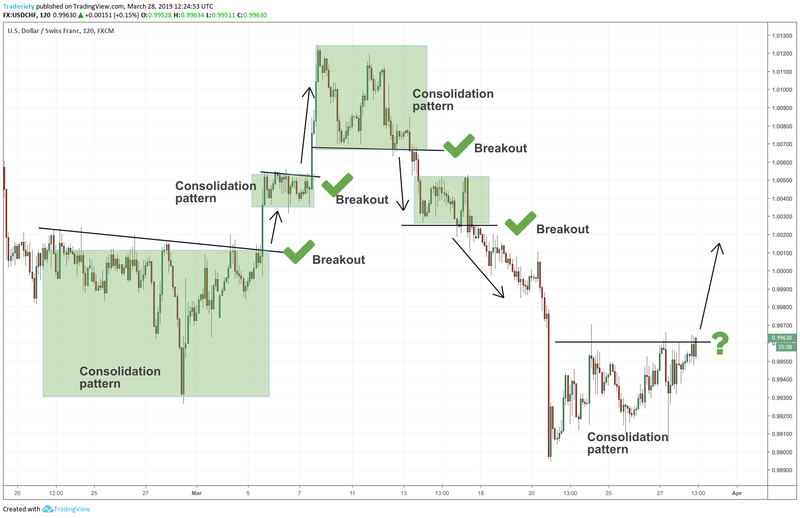 Breakout traders are pattern traders and breakout traders typically look for sideways consolidations, head and shoulders, wedges, and any other consolidation formation. The scenario below shows a wedge, which is a so-called consolidation pattern. The characteristics of a wedge show that the previous uptrend is slowing down because the price cannot push higher as easily. A breakout trader then waits for the market to make a significant move into the opposite direction and break out of the pattern. 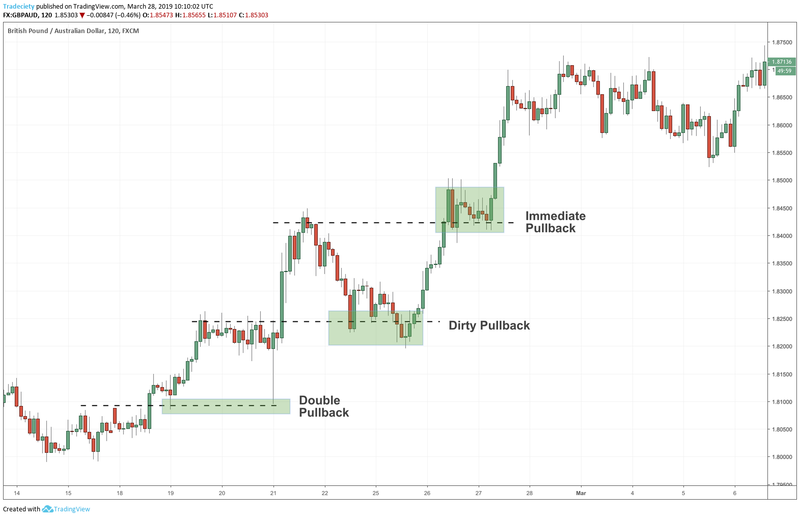 Breakout trading is very versatile which is why it is so important to define if you want to be a trend, reversal or pullback breakout trader. Each market phase follows its own unique rhythm and needs to be approached differently. As I said, although I see myself as a reversal / early-trend following trader, I also say that I trade breakouts. It helps me define my trading persona even further. I want to see clear patterns with a well-defined breakout point at a market turning point. Most traders are never sure about what it is that defines them and knowing about the differences and the overlap can be helpful in determining your trading business plan. 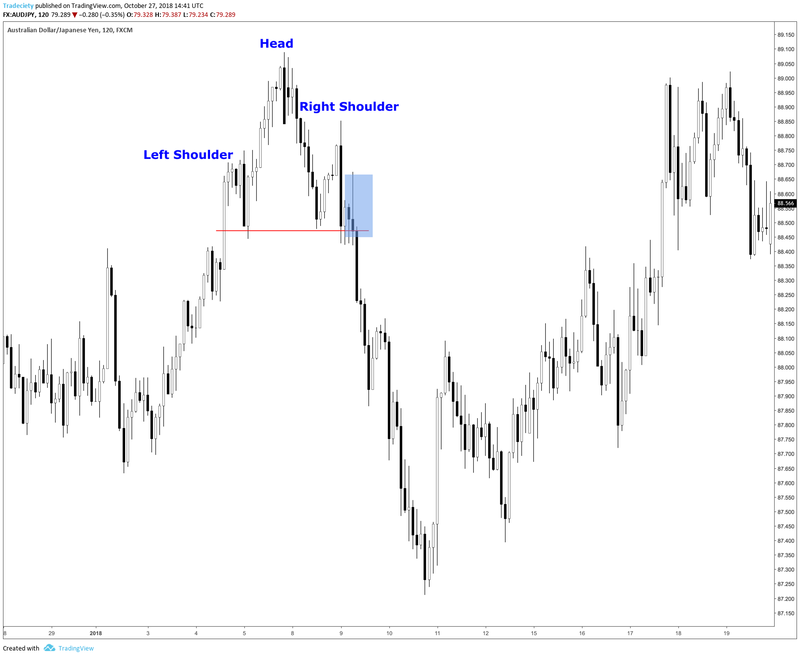 I trade many different reversal and breakout patterns, but one is the classic Head and Shoulders. 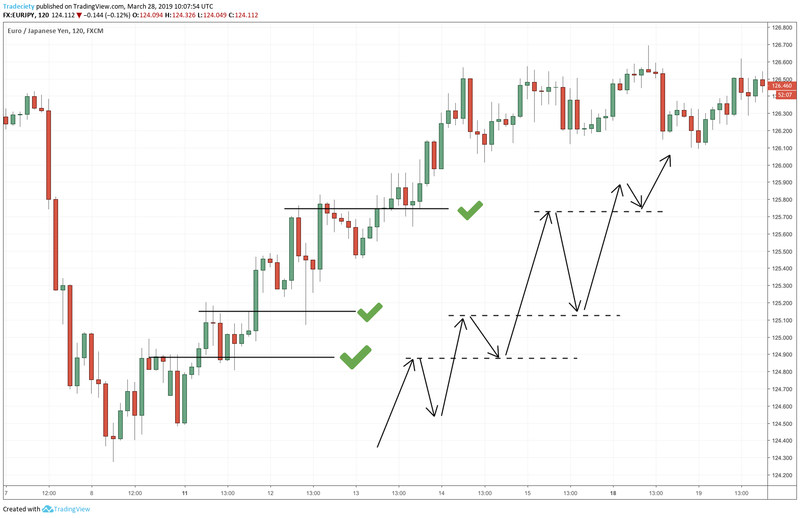 The Head and Shoulders pattern describes market turning points nicely, it provides a clear breakout point and also does not try to predict an absolute top or bottom. Fakeouts can be viewed as some type of reversals, but I personally see fakeouts as failed setups. For example, in the screenshot below the market tried to break out of the low and the high and got rejected each time. Fakeouts happen around very prominent highs and lows and often act as a “stop hunting” tool by the smart money and the institutional players. Within the framework of my supply and demand strategy, I also trade spike fakeouts. 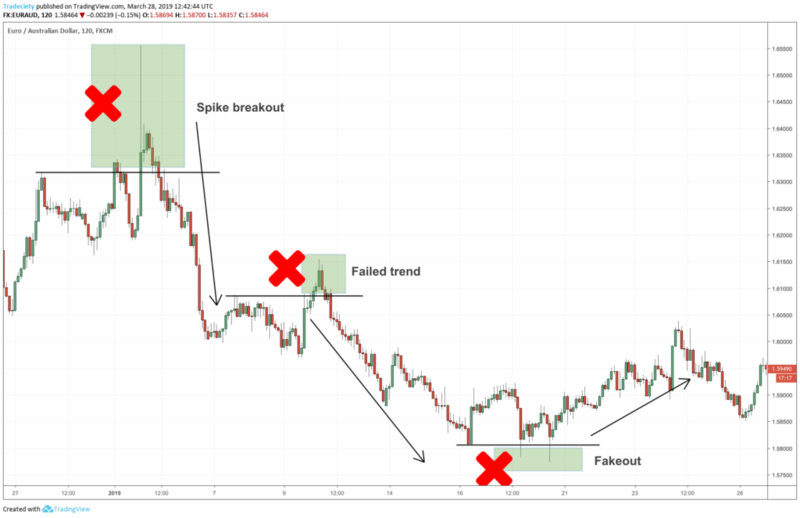 Spike fakeouts are classic traps where the market makes a strong and sudden move and then immediately reverses into the opposite direction. The stronger the fakeout/spike, the stronger often the following price move. The screenshot below shows two fakeouts and each case showed a well-defined consolidation first. 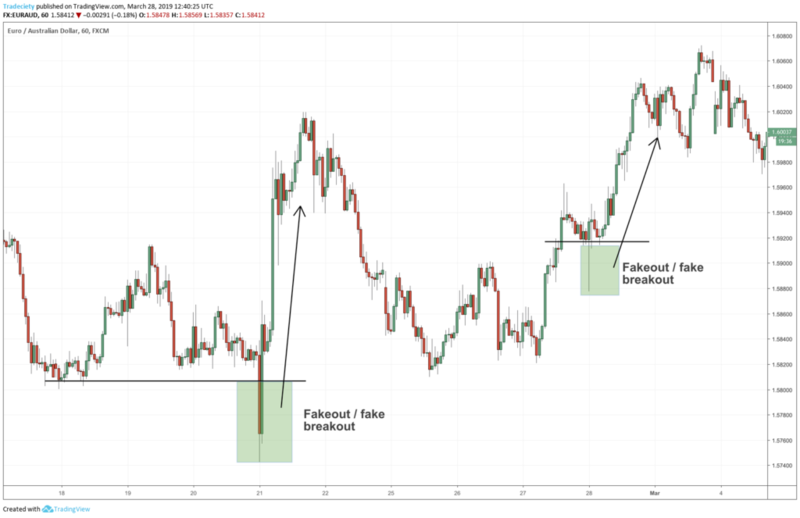 The fakeout makes it first look like a breakout, but once the trap snaps and the price turns around, a fakeout is created. Breakouts and fakeouts can often happen in the same spot but are opposite to each other. A trader who trades both trading styles is easily confused and jumping from signal to signal can lead to disastrous results. This is the exact reason why I said that choosing one style is the best way to go. The next screenshot shows, once again, that fakeouts usually happen quickly (impulsively) and are different from reversals. Especially the first left example shows one of the most profitable fakeout patterns. Whenever a market leaves such a strong wick after failing to break higher, a downtrend is often the logical consequence because the buyers didn’t have the strength and were completely blown out by the sellers. I consider myself a purely technical trader and do not use fundamentals to make trading decisions. However, for the sake of completeness news and macro trading must be listed here as well. Fundamental traders either trade the news data directly. Those traders will wait for GDP, FOMC, interest rate announcements or NFP and then trade based off those numbers. One way to trade NFP is to look for fakeouts around the initial news release. This is a common behavior and price often spikes into one direction at the initial release, just to reverse sharply after. Thus, waiting patiently for the first move to reverse can potentially be a trading strategy worth exploring. Alternatively, big macro traders use things like the COT report to understand how the big players are positioning themselves for long-term trends. One thing that is important to remember is that you never trade the actual news number, but how people perceive the news. Very often you can see a very bearish price reaction even though the numbers are positive. Thus, never just rely on the news data as your only deciding factor. Now comes the question: which time frames do you trade? Generally speaking, you can usually trade any strategy on any time frame. There is no better or worse timeframe. There is no single best time frame. 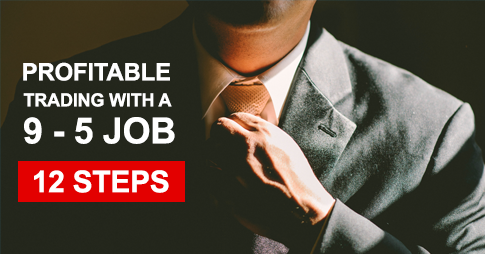 It only comes down to what YOU prefer, where you have your strengths and what suits your risk profile. Do you like to hold trades long and do you have a high level of patience!? Then swing-trading on the higher time frames is the best choice. If you need action, get bored easily and are emotionally resilient, then being a day trader on the lower time frames is the right choice. 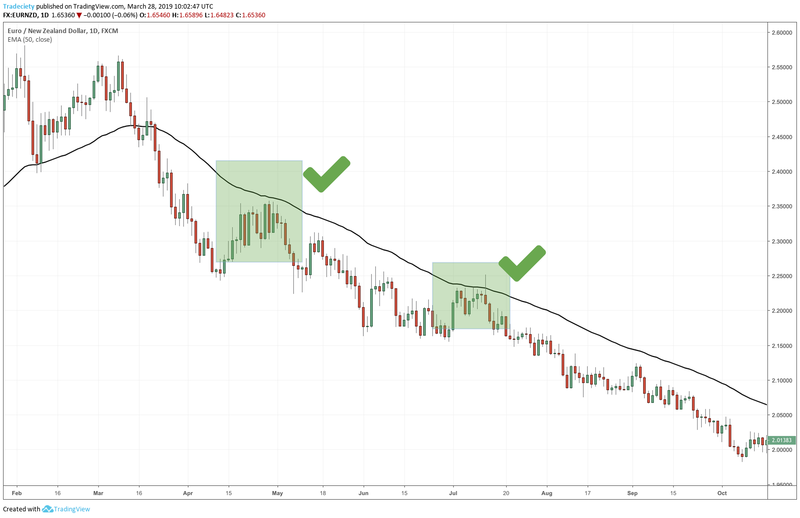 I recommend trying out both styles, using the same strategy, and you will quickly get a feeling for what type of trader you are. And please stop asking what the best time frame is. The right time frame for you will be different from the one other traders prefer. Once you made a choice which strategy you want to master, forget about the rest. 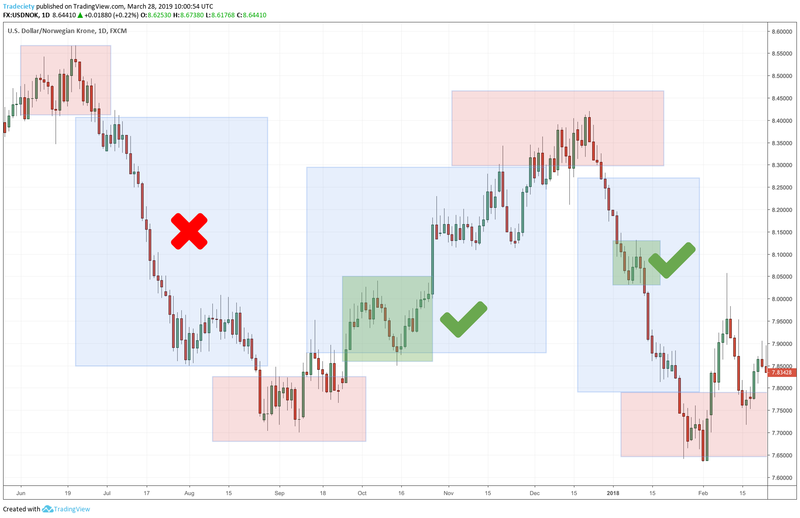 There are, of course, dozens of different trading strategies for the various trading styles, but you should at least stay within a certain style. Do you want to be a trend follower? 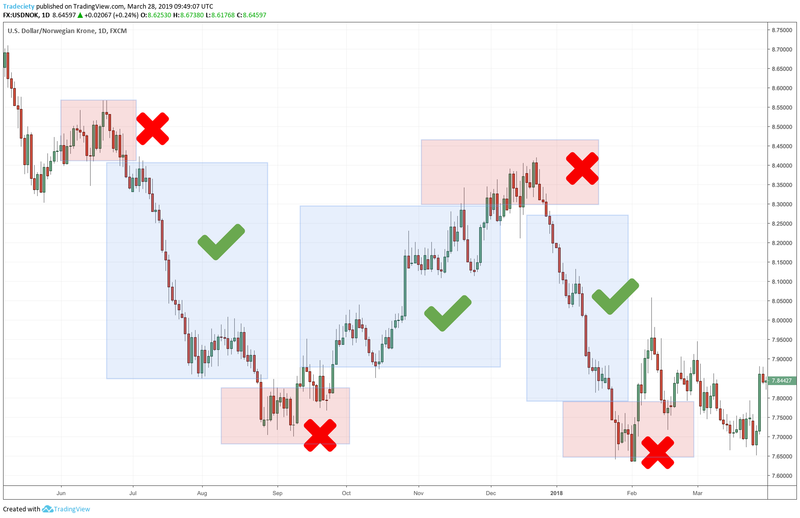 Good, there are dozens of ways how to approach trend following trading, but do not suddenly switch to a reversal strategy. If you want to trade breakouts, stay away from fakeouts as they are often the complete opposite. What trading style suits your thinking best? Let me know in the comments below and also how you came to that conclusion. Congratulations on high relevance content and free. Thank you! Thank you Rolf and Moritz! Definitely on my reading list this weekend. Breezed through it quickly, looks like excellent info . Thanks much.